It was once a favorite of historical figures like Paul Revere. 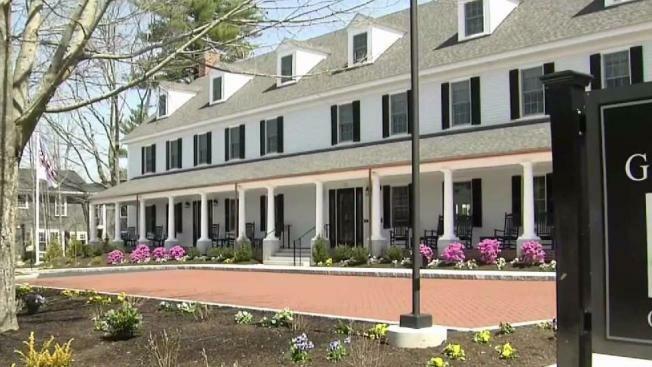 And for the first time since a fire nearly seven years ago, the Groton Inn will be open again. Once a favorite among historical figures such as Paul Revere, one of the oldest inns in the country will re-open this week for the first time since it burned to the ground in a 2011 fire. The Groton Inn is all new inside, but it features plenty of tributes to its old history. From the rocking chairs to the offset columns, the exterior of the new Groton Inn on Main Street looks a lot like the old one, and those behind it say that is on purpose. "When people drive by the inn, they see what almost used to be there," general manager Waddy Francis said. "We wanted to strike a balance for people who want the old inn and people who want today's world. I think we have a blend of both." The property, that spans from Main Street toward Gibbet Hill, has been years in the making for the Maine based Migis hotel group. It now features a third story and 60 guest rooms, which will range between $169 and $249 a night, depending on the season. Amenities include a breakfast nook, outdoor courtyard and banquet and conference rooms named after historical figures who were once guests. Grandfather clocks, artwork and other artifacts add a historic touch to the now modern inn. A massive new restaurant in the back called Forge and Vine, a tribute to the blacksmith that was once there, is set to open later this summer. "Economically, it is huge," Groton Town Manager Mark Haddad said. "We have a lot of things happening right now that are going to bring people to Groton so I’m excited for the future." It is a future that now includes a piece of the past that they are thrilled to welcome back to Main Street in Groton. It officially reopens on May 3. "It still has that sense of graciousness and historical charm that everyone was craving," Francis said. "We hope to be here for at least the next 300 years."